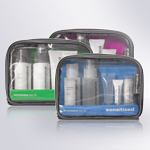 Dermalogica Skin Kits provide all the benefits of a full regimen while you are on the move. The travel size is ideal for taking all your essential Dermalogica products on holiday in a handy pouch. In addition, Dermalogica Skin Kits are a convenient size if you wish to try some new products for the first time.